…or are they? They do look so much like sweet violets. I had a look at various sites on the internet and found that apparently dog violets hybridise with another darker viola (Viola reichenbachiana), which results in the Viola bavarica. A Bavarian violet! How lovely! They are all very similar (to my eye at least), but the Bavarian one has a pale violet-coloured spur, whereas V. riviniana has a white spur and V. reichenbachiana a dark violet one. I’d like to think I have a Bavarian violet in my garden, as it would be fitting, but on taking a closer look mine still resemble Viola odorata most of all. So why do they smell only very faintly? Any violet experts out there?! 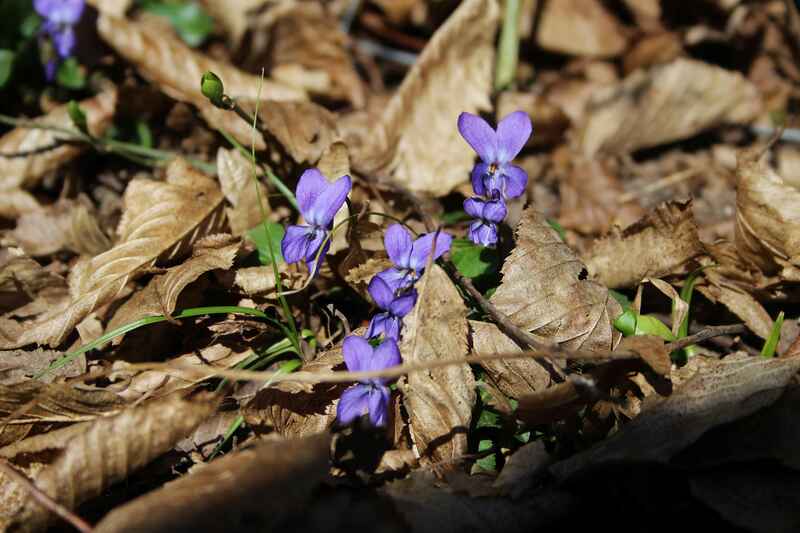 Do you see wild violets near your home? By the way, looking back at past spring photos I can say we are a full month ahead of last year, bloom-wise, if not more. And one or two weeks ahead of 2012 too! This entry was posted in Countryside, Garden, Nature, Plants and tagged Botany, Countryside, Garden, Nature, Plants, Spring. Bookmark the permalink. Spring…. I wish it would show up here. Any problem with the air pollution on your area? Air pollution is not an issue in my local region – in fact we live in an area designated as a “Luftkurort”, which is something like a climatic health resort! The more you smell Viola odorata, the less it will smell, somehow it stops the olfactory nerves from working after the first sniff! We have lots of violets in the garden here, they seed everywhere and I have found out that if the leaves are near where the Silver Washed Fritillary butterfly lays its eggs in the bark of trees, the caterpillars hatch out, come down the bark and feast on the violet leaves! I’ve heard that about numbing the nerves too, so it must be true! It’s great when you find such a connection between plants and wildlife in your own little space. We have a little piece of woodland just beyond our garden and I discovered some Honesty growing there a few years ago – and only days later noticed several Orange Tip butterflies which apparently feed on it. I was so pleased when I then read that the Orange Tip caterpillars like garlic mustard plants which I had specifically left standing near our old compost heap! The violets are lovely! What a splendid sign of spring! It is crazy warm this weekend, in the low 70’s which is warmer than our summers! I will be out digging in my little patio herb garden, taking inventory and weeding. Happy Spring! Enjoy some gardening days Deb – it is the perfect time to take stock of things and do a little pottering before the real work begins! I hadn’t realised just how many different sorts there are until looking up mine. Hope you see/smell some soon Michael! You have some truly beautiful close ups there, and in dazzling sunshine – yey! Thanks – the sunshine was wonderful and warming. I always think of violet pastels that we occasionally ate as children… Violet biscuits sound nice! I don’t think I ever made them in the end, but I’m sure they would have been very tasty – the fairies wouldn’t have got a recipe wrong, surely?! And those pastels … parma violets, weren’t they? Not sure if I liked those or not … very floral! I was never too good at detecting violet scents, pansies were the only ones which I could ever get a smell out of….. and even then it was only when I stepped into a greenhouse full! Maybe you are also among the violet-scent impaired 😦 sorry. As long as it’s restricted to just violets…. I couldn’t imagine not being able to smell my peonies, the elderflowers or the lavender! I can’t solve the perfume enigma but the violet is very pretty whatever it is. I love the pictures and your words all blended together beautifully! Hugs and blessings! 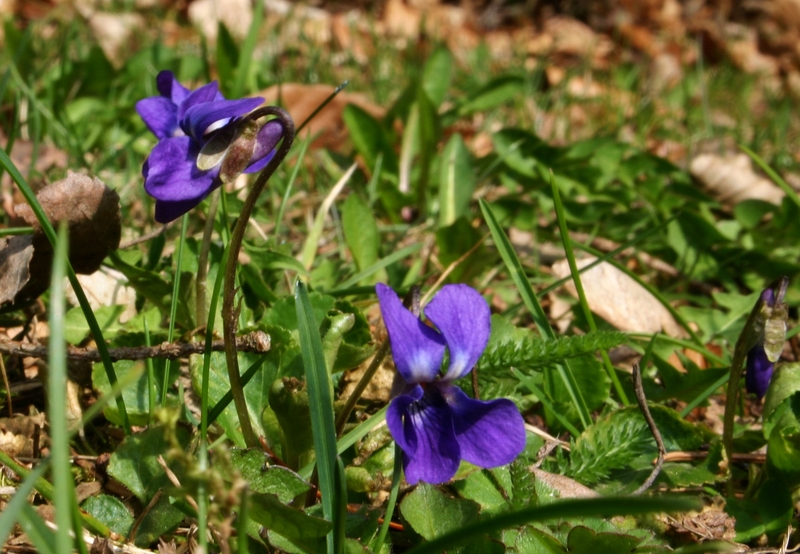 I have several different wild violets that grow in my garden…just need the snow to melt. LOL! I have also bought a new one (no name) and it smelt almost unpleasantly strong in the warm car… I can at least smell that one in the garden! Enjoy the photos instead for now Sheryl, and hope it’s still warming up slightly for you! Yes, we have lots of wild violets. In some shaded areas I allow it to form a ground cover. Mine have spread like mad in the flower beds, but the wild ones in the lawn stay in the same place every year! We don’t have any wild growing violets anywhere. I’d love to have some though! I wonder if any of your neighbours have them…. if so it won’t be long before they turn up in your garden too, but they are one of those plants that choose their spot carefully! Bavarians are often unique 🙂 ! I have seen carpets of typical violets – and surprise with some white ones among them! When I talk to my Mum in England we compare constantly what has flowered in our respective gardens. I only seem to have come across wild violets since living in Bavaria though, so they must love the soil in this area! I’m catching up reading blogs tonight and I see where your pretty violets in a vase came from. These are lovely deep color and stand out perfectly in the sunshine. So you’re an entire month ahead on your blooms–wow! Enjoy them all. Thanks Susie. The weather has been amazing this month! I adore violets, I have them in pink, purple, apricot and white. My favourite though is the wild Viola odrata which I didn’t plant but which comes up everywhere in my garden. What an exquisite but elusive perfume. Have you tried crystallising them? They are delicious. Thanks Debra. My Mum always has an African violet or two in the house, but I have never been very successful with houseplants! The wild violets are more transient and only flower for a few weeks.